1. Your web store is still open for business. Your customers will be able to shop there right up to a few days before Christmas and still get delivery. Standard shipping rates will continue through December 16, after that your customers can still order, but their shipping methods will begin to become more limited as the holiday window begins to close. They will see all of this when they check out and choose their shipping method. 2. You may have noticed multiple invoices coming your way on your catalog orders. You will get an invoice after your order has been scanned, this is really just for reference, shortly after you get the email notice that your order has shipped you will get a final invoice..... this is the one that is all-in and the one to pay. 3. If your invoice sale was over $5000 you will see a 3% prompt pay discount calculated into the final invoice. 4. Late Orders are annoying and to be expected! Late orders are invoiced separately from your main order and charged shipping. Give it a couple of days, and scan what you have to me so that we can process as many as possible at once to save on shipping. It's helpful when you email me those if you include your group number in the email so that I can forward to Yankee Candle immediately (from my phone) rather than having to wait until I am back at my desk where I can look up your number. 5. Broken or damaged items? You can let me know the name of the seller and the issue and I will take care of a claim....HOWEVER....you, your customer or your seller can call the customer service line at 800.351.1533....they will only need your group number, seller name and the issue. I am happy to take care of it, but as with the late orders, I can't always get to those things until evening when I am back at my desk. 6. FedEx drops off our order but we are missing some entire orders. Give it a day or so, magically those orders generally show up...if NOT...you can call customer service and let them know that the order for that seller is missing and they will file a claim and get the ball rolling...or you can let me know and I'll do the same thing on your behalf. 7. When do you think my order will ship? As we inch closer to the holidays things will start to slow down. We are looking at roughly 21 days from the date that your orders were received at Yankee Candle before your order goes out the warehouse door. You will get an email that has tracking info. If you have a large order that is being delivered via XPO Freight they are required by contract to call ahead and schedule your delivery date and give you a window of time. XPO is also required by contract to move your order from the truck into your building under cover. They are going to be working with large pallets so will not be moving things through the music room, and onto the stage....lol....but they will get it inside, under cover. If that doesn't happen, please let me know, we can't hold our vendors to the contract if we don't know if there are issues. 8. I am going to posting these updates on my website under the Q&A blog www.blackriverfundraising.com you can always double check there. 10. I appreciate your business and even if your group forgets to THANK YOU for the work that you do on their behalf....I recognize the time and organization that you bring to your fundraiser and thank you for all that you do. Shop the holiday store for JUBILEE DAY CARE CENTER. Each sale earns 40% profit! ​Q: Why should I choose Yankee Candle? A: Yankee Candle® Fundraising offers you a nationally recognized brand that supporters of your group will trust and want to buy. 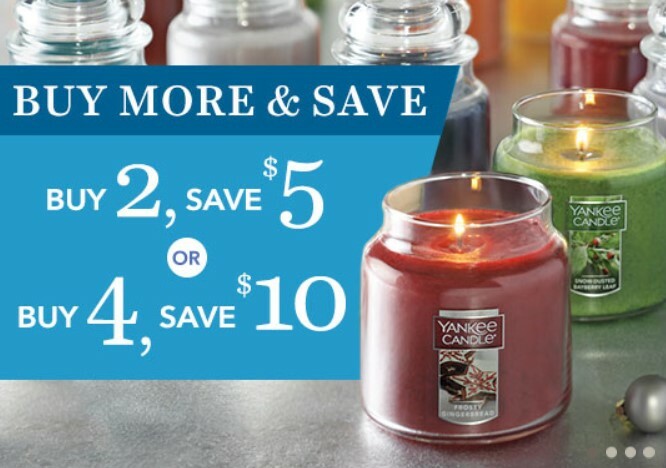 Prices are comparable to those in Yankee Candle® retail stores. We have gifts that your supporters will want to give and receive across all price ranges. Q: Do I have to sort candles? A: No, Yankee Candle® will individually pack your orders by seller. In addition, there are no minimums and no up front costs to get started. Q: How soon can I start? A: Yankee Candle® needs 7 to 10 days to prepare and ship out your sales materials. Q: When can we run a Yankee Candle® Fundraiser? A: We have 2 selling seasons - Fall and Spring - each with it's own unique selection of product. 1. Fall runs from July to December. Q: How long does a sale last? A: We recommend a selling period of 10 days - 2 weeks. Q: Does Yankee Candle® limit the number of sales in a given area? A: Yankee Candle® does not limit areas, but your local sales consultant can help to coordinate your sale at a time where there is as little conflict with other groups. Q: Does my group have to be tax-exempt or non profit in order to participate? A: Yankee Candle® Fundraising programs can be run by any non profit organization as well as groups that are raising money for the sole purpose of enhancing their program. Q: How does the pricing compare to retail? A: This is the key to the success of the Yankee Candle® Fundraising program. We price our product within $1.00 of the retail store prices. In many cases, our product reflects the price that you will find in our retail stores. Q: Can we do both a Fall/Holiday and Spring sale? A: Yes. 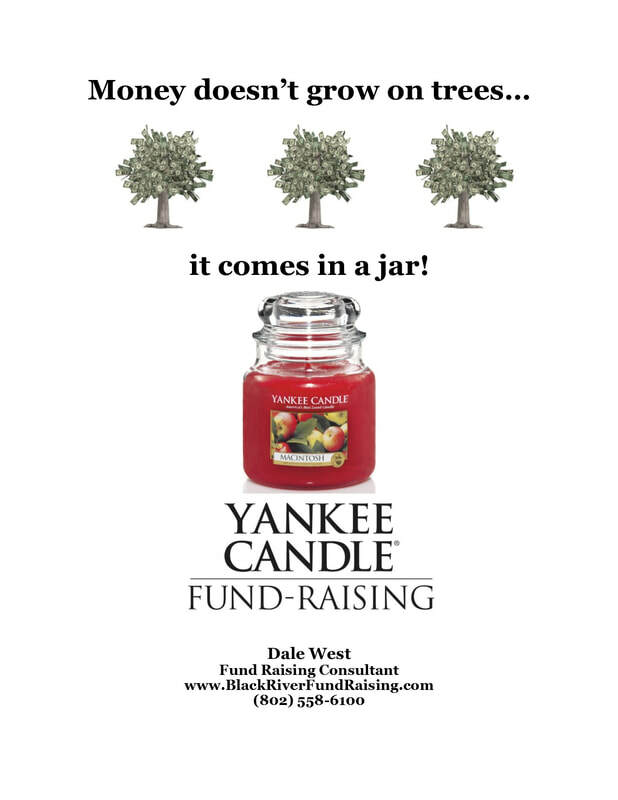 Many groups have chosen to run both a fall and spring program with Yankee Candle® Fundraising. Because we offer two unique product offerings designed for the fall and the spring, our groups find that they always sell well. Q: What type of support do I receive? Q: Can our customers order over the internet? A: Yes, online ordering is available. Yankee Candle® Fundraising realizes the importance of having online sales. Yankee Candle® requires a guest to have a group # to start shopping. Click "Start Shopping" from home-page. Organization earns profit from each purchase. Q: What other costs are there? Shipping? Sales Tax? A: There are no up front costs to run a Yankee Candle® sale, nor will you pay for your sales materials. Yankee Candle® will even provide you with a pre-paid FedEx envelope to return your orders for processing. There is a nominal shipping charge and sales tax is based on your State Laws. We encourage you to check with your local tax agencies to determine your responsibility to your State. Q: How do I get more order forms or sales packets? A: Additional sales materials are available through your consultant. Order forms are always available on line at www.yankeecandlefundraising.com. Q: When should we collect our money? A: We recommend the collection of all money at the time the orders are taken. Q: How long will it take for our order to come in? Q: How do I handle payment/profit? vi. Total Amount Due to Yankee Candle® - You keep the profits! Q: How would I make a payment with a credit card or with my checking/savings account? A: Call 1-855-YCC-FUND. This easy payment option is available to you 24 hours a day, 7 days a week. Please have your customer number, payment amount and credit card card number (with 3 digit CVV code) or your 9 digit ABA/Routing number and bank account number available. Q: How do I handle late orders? A: Yankee Candle® is happy to process any late orders. 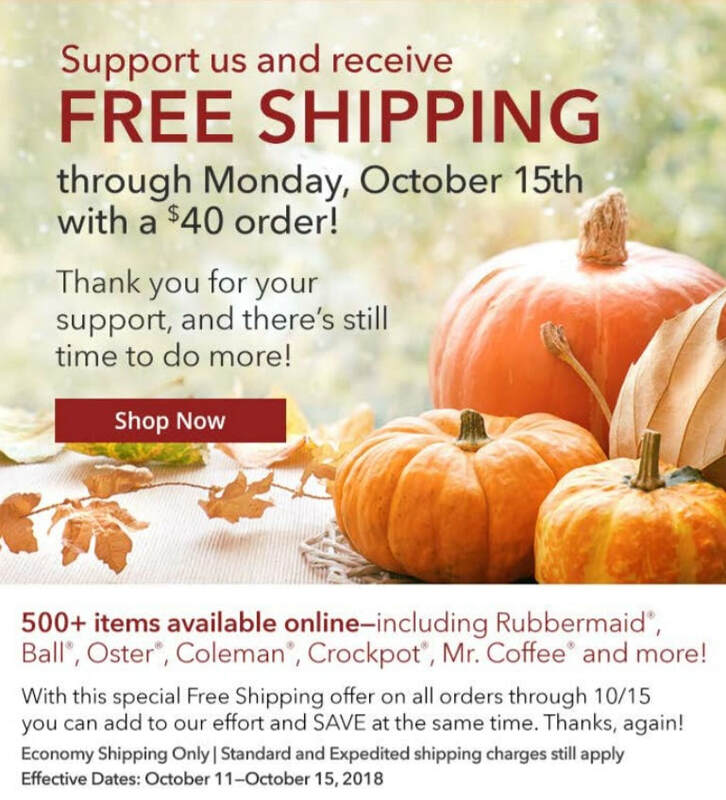 Any order coming in to Yankee Candle® after receipt of the original order, will be considered a late order and will be subject to shipping charges. You will receive an e-mail invoice and a hard copy invoice for any late orders placed. A: At the time of shipment, you will receive an e-mail notification of shipment. This e-mail will contain attachments which include your seller breakdown along with a group summary of product ordered. This e-mail will also contain all tracking information to follow your order. You can also contact your Sales Consultant. Q: How do I handle missing or broken items? i. Using our Claims/adjustment form attached to your shipping notification. 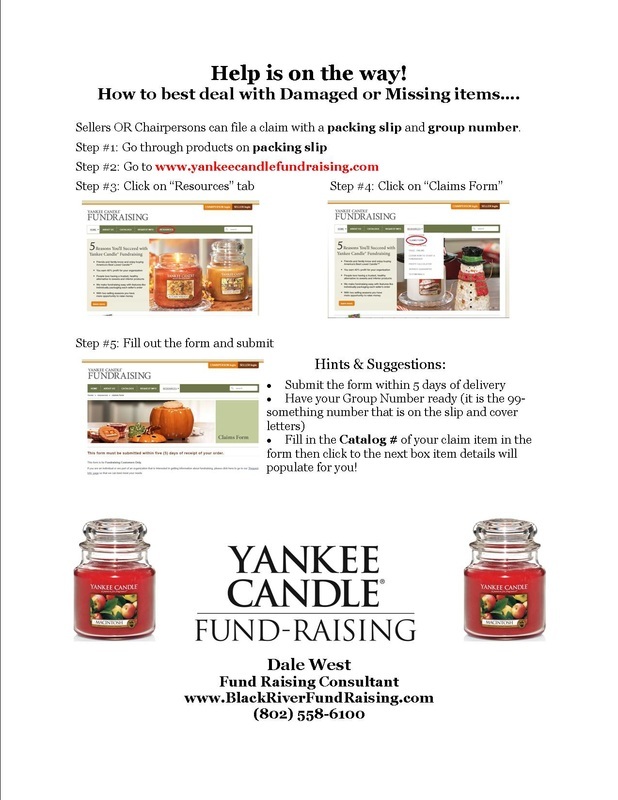 You may e-mail form toFundraising_claims@yankeecandle.com, fax to (413)665-0099 or mail this form in to our order processing center. ii. Complete and Submit Claims form on line at www.yankeecandlefundraising.com, Click Resource Tab and select Claims Form. Q: How do I make changes to my sale? A: Any changes to your sale set up, including dates, names or addresses, can be handled through your sales consultant.